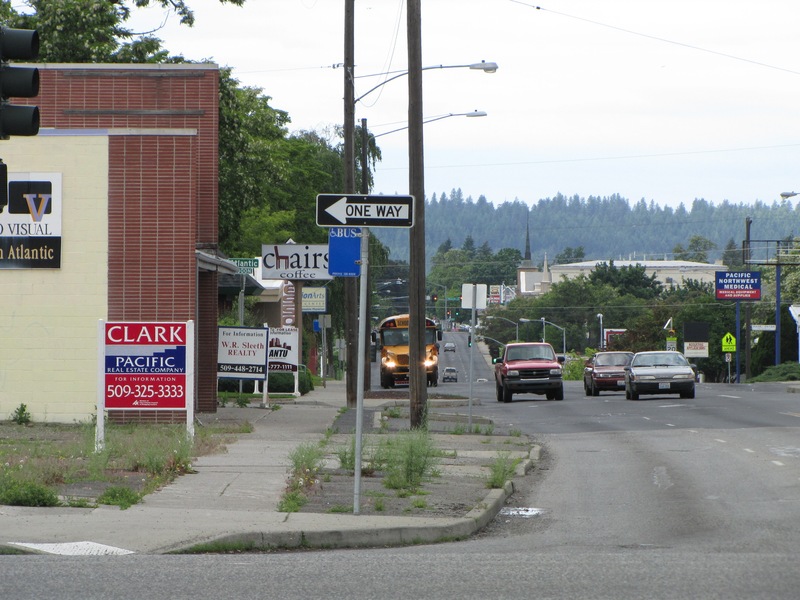 The old block long Ziggy’s store in Hillyard, at right, now empty (the empty store extends well off the right of this photo). 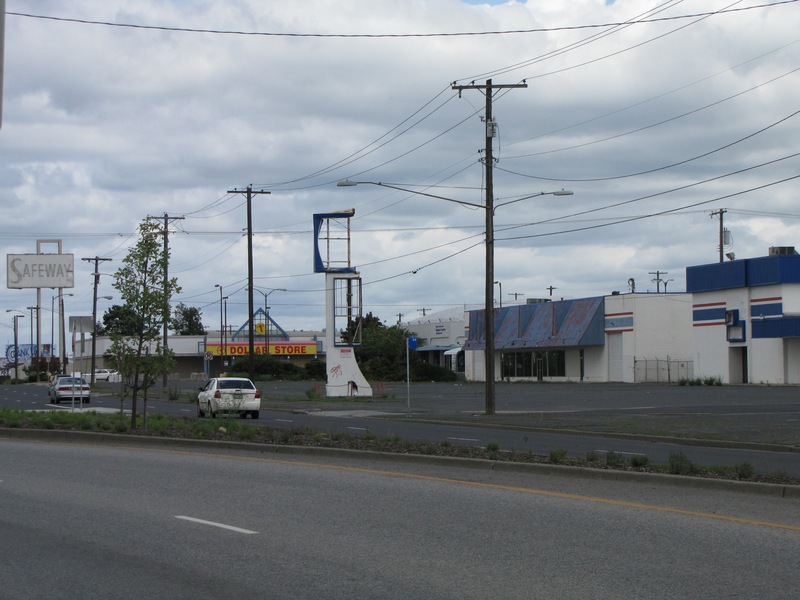 The Safeway is gone, and the Dollar Store chain filed for bankruptcy. The Hillyard Center (government building), hiding roughly in the center, is still there. Back to the right and behind where this photo was taken, there are about 3 blocks of empty buildings or lots, several with for sale or for lease signs. Across the street the Armory building’s parking lot is empty and weeds are growing through all the cracks. What’s up with that? The statement from Sen. Cantwell says L.A.is “the second most travelled destination after Seattle and before Portland“. The Federal government will give SIA a nearly $1 million grant that “would enable the airport to recruit a carrier by offering short-term risk-offsets while the market fully establishes itself“. Previous air service to L.A. died after 2004, when the economy was good, and died again in 2008. No grants were used in 2004 or 2008. And we think in this economy, this service will now fly on its own? Hello? The 2nd most travelled destination needs a bribe but the other 9 cities below that level do not? This grant looks like a crony capitalist bribe as the logic in the explanation does not pencil out. In this economic disaster, why would this air service last any longer than it did when it died in 2004 and died again in 2008? Will something be done fundamentally differently this time to achieve success? Getting “free money” from the Feds sounds great, but like the more than half a billion spent on the North Corridor Freeway to/from nowhere, this “feel good” grant will likely have a similar outcome of temporary spending that does not produce the ROI we need right now and long term. About half of all income in this area now comes from government wages, transfer payments, the government’s share of health care payments, plus outright subsidies of lots of stuff. Like this. This is not sustainable. The Spokesman-Review did a great job with timely reports covering the Garland District fires with stories and photos -see Fire destroys Fergusons Café, badly damages Milk Bottle – Spokesman.com – Sept. 26, 2011. And wow – another fast turnaround tonight – good job! They were chided for slow coverage of a shooting and SWAT team standoff not long ago and deserve recognition for a great job with these events. The Merry Scamsters of Spokane Strike Again! – Forbes. Further north on Division at Indiana and another block of emptiness. And more weeds. This was probably taken in June. When I drove by around Labor Day, the weeds were about 3 feet high. Scary. This photo was taken quite a while ago. These buildings are still empty, last time I looked. 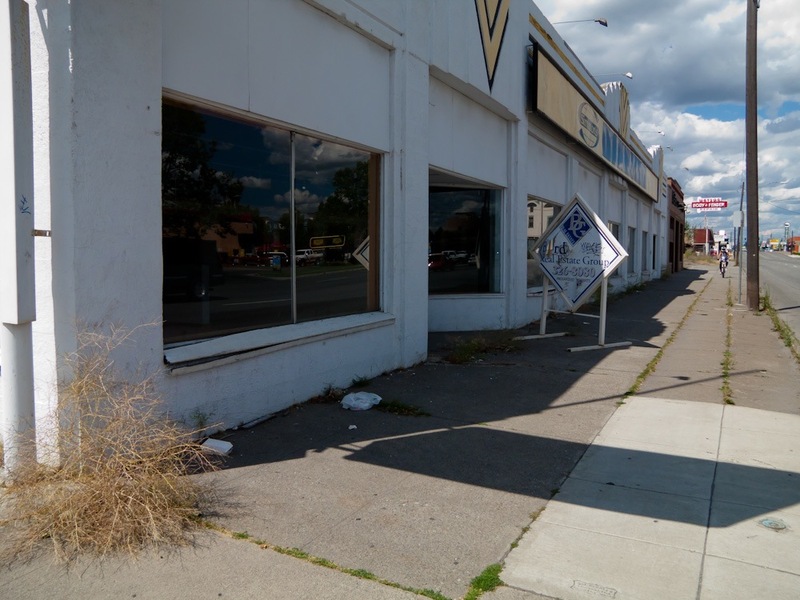 But when I took this photo, there were also empty buildings further to the west, including about 2/3ds of an empty strip mall, plus emptiness across the street, and behind me to the right on the east side of Division. Some of those have filled in so its a bit better today. Let’s hope that continues. But still – pretty scary. May be we could grow a corn maze in the vacant lots and use them for fall harvest festivals and Halloween entertainment? There are are 17,000 fewer non-farm jobs than in August of 2008 and this is the smallest number of non-farm jobs in the local market since January of 2005, and 10% below the peak level reached in late 2007 . The average number of employed, Jan-Aug in 2010 was 203,200 and in 2011, was 202,850. 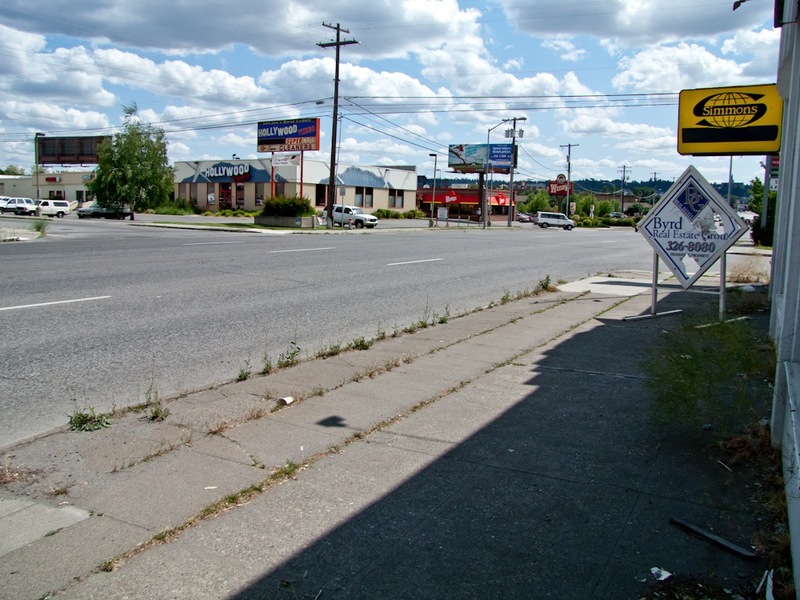 The State says Spokane has a “stable jobs picture” and there is not a “negative trend”. Update: August is often a low point in jobs during the year. You’ll note that the number of employed goes down in July by 3,000 to 5,000 but up in September by the same amount. The official explanation is that local school districts employ staff on 10 month annual contracts. I do not know if that makes them eligible for 2 months of unemployment compensation, or not, and if that impacts unemployment in the summer. The September 2011 non-farm jobs numbers will probably come in at 203,000 to perhaps as high as 205,000, and then end the year around 203,000, less than in 2010. Update: This has now been confirmed. The local school districts lay off their staff in June and then rehire all of them in September. Spokane County’s unemployment rate fell to 5.7 percent in September, pushed downward by the return of teachers to classrooms. Tweedy said the September improvement is a seasonal impact, resulting from schools adding staff after the summer vacation. That is according to Spokane area labor economist-for-life, Doug Tweedy. 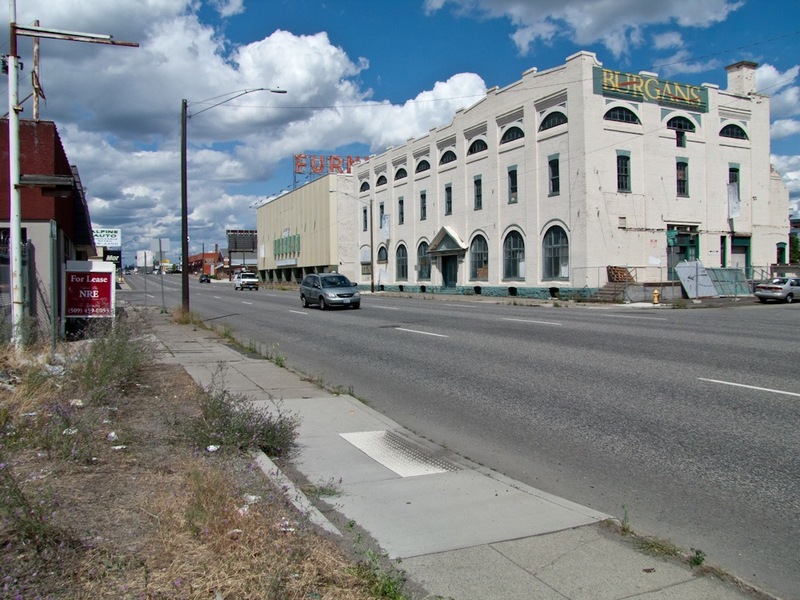 Just north of downtown along the main north-south road – literally blocks from downtown – we encounter dead buildings. Abandoned buildings and weeds. Across the street from this is the empty Hollywood Video store (out of business). 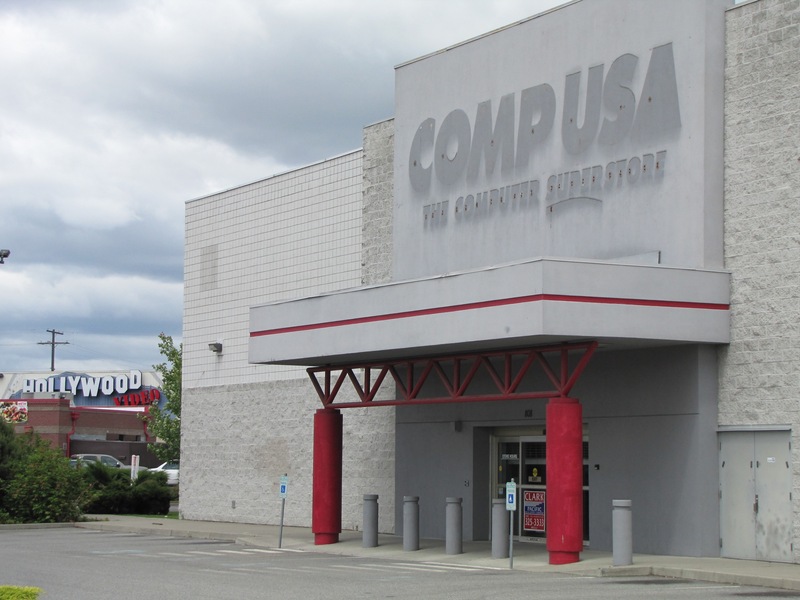 On the other side of Hollywood Video is the now closed CompUSA store – the national chain went out of business. 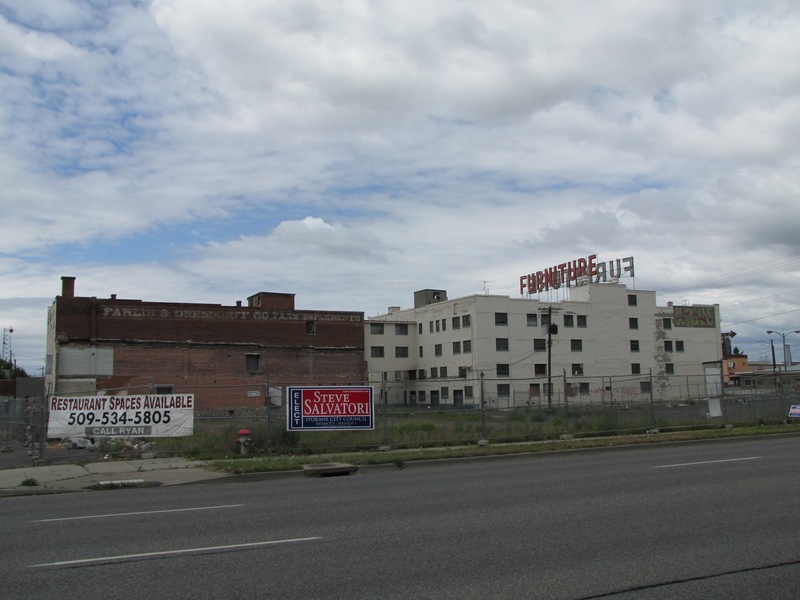 Back on Division and 200 feet north, we look across to the vacant Burgans Furniture store, a block long eyesore. And more vacancies on the left side of the road too. More weeds. And the same complex from the back side on a different day. These photos were taken last spring or early summer – kind of early for a Halloween horror and haunted house tour but definitely scary. Made me scared.